Sometimes things just come together and you get the opportunity to have a bit of extra fun. Picture this: a very tiny poster at my local railway station catches my eye and it promises cheap rail travel up to London at weekends during August! Don't mind if I do. What visits do I have outstanding? A brief trot from the end of the Victoria line is the William Morris Gallery. Named Art Fund Museum of the Year 2013, it has benefited from a recent £5million transformation, presenting the beautiful collection to the best advantage. It's free to get in and runs a series of splendid exhibitions throughout the year (A Memory Palace of her own by Margje Bijl, as discussed in the last post, will be there from 11 January until 9 March 2014). Each room has a theme revolving around different periods in Morris' life. 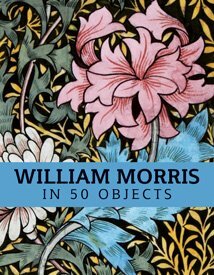 You can explore his childhood, the birth of Morris and Co, his workshop and his beliefs. The rooms flow easily from one to another, the story holding a gentle continuity, which is damn near impossible when discussing someone so multi-faceted as our Topsy. Somehow they managed to show how everything came from a spark of inspiration, traceable to moments in his life. Visits to cathedrals, love, work, everything illustrated by a rich collection of objects and some of the most delicious art that I couldn't believe wasn't in a national collection's store (wasn't I grateful?). Not only Morris' work was shown; work by Burne-Jones and Rossetti also appeared, naturally enough, to show how close he was to his friends. I loved the Morris and Co room the most because of the two chairs. That is genius and tells you everything you need to know about Morris' ideas about home design. You don't even need to read all the lovely interpretative panels because it is a punchy visual that shows you. I am giving you a round of applause, Morris Gallery, you rule. It has to be said that Morris' work is not a naturally kid-friendly subject in many ways. There is a lot of subtext and ideology to get your head round, so I wasn't sure how much Lily would enjoy the museum. She was in a very good mood when we got there after playing with a raccoon on the train (no, really) but even so I thought she would be a tough crowd. She was instantly won over by the giant interactive map where you have to find different properties by dragging the icon around a modern map to reveal how rural it was in Morris' day. Each room had something for her to do, from brass rubbing, wallpaper design to building her own cathedral complex. There is also a trail for children you can buy for 50p but we managed well enough without it (if you had more than one kiddie to entertain it might be a necessity). If I had any criticisms, and on the whole I really don't, it would be that I needed a bit of signage as I entered as the hall doubles as a shop and the staff were all occupied with customers. As it is a free museum you can just wander in and so I had to make a bit of a guess where to start, but once you get going it all flows naturally. I would also have liked to see more objects that were Morris' own things, but I think that they probably don't exist. The smock that was hanging in the first room was a replica, but I would have liked to see more of his personal effects rather than things that sprang from his genius, but it may seem a little picky to want to look at that when he was a well-spring of such beautiful things. Yes, it's bloody gorgeous. They also sell a tshirt that reads 'Beautiful and Useful'. Of course I bought one. Visit the website here and get yourself to Walthamstow to see how beautiful it is. Hi Kirsty, Next time you will visit the Gallery, you should visit the archives, if you wish to see more of the personal effects! They have a lock of William Morris's hair and some of Jane Morris's letters. And ofcourse, in January, you'll get to meet Jane's double, in person! You do visit the most fabulous places. Another for the 'if I'm in the vicinity' list. I do love the t-shirt idea - it says it all, really. Thank you for sharing this trip. I hope people will pop in and see them, they have done a splendid job. I am sporting my tshirt today, there is a photo of me in it on The Stunner's Boudoir page on Facebook. Visited this museum way back in 1975, must get back and see it again. So much to see and do sigh! so incredibly jealous in the best way. an archive? a lock of hair? be still my beating heart. not too much in the way of morris here in baltimore, though they did lend 2 textiles and a photo of lizzie to the immense pre-raph show. if I ever get over to england, you won't be able to kick me out till I've visited everything! There are so many splendid places to visit and I really intend to make the effort to do as many as possible! It would be silly not to, especially if I can come back and talk to you lot about them. Next stop is Port Sunlight in a couple of weekends time!